Estimated reading time: 4 minutes, 15 seconds. The summer is passing by quickly and before you know it, fall will be here. This means you must cram all your favorite summer activities into just a few more weeks. How can you make sure you get in everything you want to do this summer? Easy. Create an end-of-summer bucket list. Get the most out of the last few weeks of summer and create an end-of-summer bucket list. The difference between a real bucket list and one made just for summer is that your end-of-summer list will detail only the things you want to accomplish by the end of the summer, whereas an actual bucket list has a more open-ended schedule. Need some ideas for your end-of-summer bucket list? Here are some things you can do by yourself or with friends and family. A visit to the beach is a mainstay for many Americans in the summertime. And, this is something that can be enjoyed no matter where you live. The truth is, beaches aren’t restricted to just the east, west, and southern coasts. Even mountain lakes have shorelines. The beauty of being at a beach is relaxing by the water, and you can get the same experience sitting for a spell along a lake or even a river. Summer is when the top artists head out on the road, whether by themselves or as part of a festival. These events are typically held outside and there’s nothing quite like listening to live music in the fresh air. This season try to make time to catch a summer concert and it will make your summer a more memorable one. Camping is a popular American vacation, but you don’t have to travel deep into the forests to enjoy it. Best of all, you can make a campground in your own backyard if you don’t have the vacation time to visit a campground. Build a fire-pit for roasting marshmallows and telling ghost stories around. Set up tents so everyone can sleep under the stars. The entire family will love it. 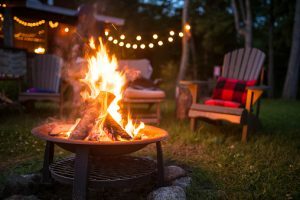 While we like to imagine summer as being the season of relaxation, it is also a great time to finally complete that DIY project. Take advantage of your vacation days to get more done. Just remember, just because you’re working on your home is no reason why you still can’t enjoy some of the other things on this list. If you are a book lover and are not reading as much as you want, then this summer is the perfect time to pick up that novel or non-fiction book you have been wanting to read. Fall in love with reading all over again. Take the book to the beach, to the campground, or anywhere else you are planning to visit this season. Set aside some time in the evenings to sit and read outside while the sky is still light. Savor the experience of turning that last page. Visiting a farm, taking a hike, or sitting and watching a sunset are wonderful summer activities. What’s on your end-of-summer bucket list? A road trip doesn’t have to be a lengthy one. In fact, you don’t even have to leave your state if you don’t want to. After all, odds are there are plenty of points of interest in your home state-perhaps in even your own town and county – that you haven’t seen yet. So get in the car, turn on the music, and just drive. Take a highway you have never driven on before and see where it takes you. There may be something special right down the road from you that you were never aware of. There are farms all over the country where you can pay a small fee to pick your own fruits and vegetables. Find one in your area and stock up on some fresh and delicious natural foods. There’s nothing better than picking your own peaches or berries and eating them on your porch. Hiking is one sport that offers double benefits. You not only get some exercise in, you also get to see amazing sights of nature. Take your camera so you can snap pictures along the way. Make sure you bring water, a compass, and some emergency supplies just to be safe. And, always dress accordingly for where you’re hiking. Although summer can be an action-packed time of year, one of the best experiences you can have involves no movement at all. When the sun starts to set, just have a seat and watch it as it dips below the horizon. It’s a simple and quiet moment that will leave you appreciating every day this summer. Summer is a season that never lasts as long as you want it to. The days can quickly get away from you if you aren’t careful. This is why having an end-of-summer bucket list is so practical. It helps keep you motivated and aware of the things you want to enjoy or accomplish before fall and winter’s eventual arrival. The above are just a few things to consider doing this summer. Create your own unique list so you can enjoy your best summer ever.